Have you ever had twisted and crimped timer tape hold back experimental progress in your classroom? Or had a piece of timer tape end before the experiment did? The acceleration Timer Tape Holder secures any timer tape up to 13 mm in width, on rolls up to 12 cm in diameter. 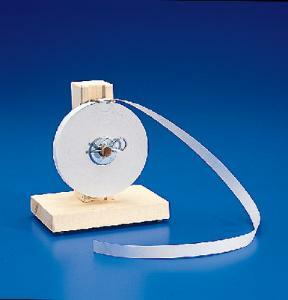 The free-rolling spindle allows the tape to glide smoothly and easily through the timer. The holder is made of finished hardwood, and the base has four rubber feet to keep the unit firmly in place. Overall height is 15 cm; the base measures 9×14×2 cm.